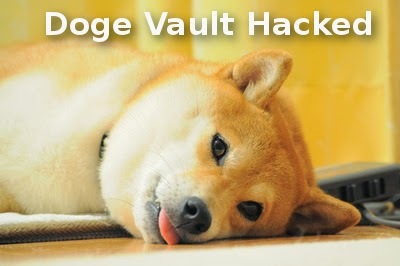 A Popular Dogecoin online wallet service DogeVault has reportedly been infiltrated by cyber criminals, millions of Dogecoins missing from user's wallet. A note on the front page of the website(www.dogevault.com) says DogeVault service compromised by attackers on May 11, resulting in a service disruption and tampering with wallet funds. The website has not provide much information about how much they lost in the heist. However, Some users at reddit reported that coins have been transferred to a newly created mega wallet. According to Dogechain records, this wallet (DHKM6NDUUv9kaHAGi1QU7MRBNKfQiAdP3F) has more than 121 million Dogecoins that is about $56,000 dollars. "We are currently in the process of identifying the extent of the attack and potential impact on user's funds" The statement on the website reads. DogeVault suggests users not to transfer any funds to Doge Vault addresses until they finish the investigation.